A wonderful human being who happens to be a dear friend of mine was feeling down, so, during my adventures in summer 2012, I sent her ten different postcards from ten different cities. 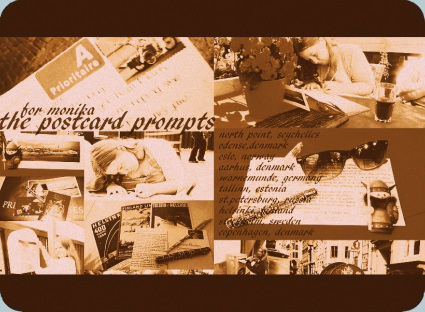 Each postcard had a story on it, each story from a prompt she had given me. These ten tiny stories are The Postcard Prompts. North Point, Seychelles: 'SNAP' - Jason and Howard fly to New York together for the first Progress recording session with Robbie. Odense, Denmark: 'BREATHE OUT' - In his book, Gary talks about meeting up with Jason at a cafe in Islington in 2004. We know Gary's reaction, this is Jason's. Oslo, Norway: 'THE WORDSMITH / BREATHE IN' - Jason prepares to meet with Gary at that cafe in Islington. Aarhus, Denmark: 'DEFAULT SETTINGS / DO YOU LOVE ME? [PT.1]' - Whilst promoting Beautiful World, the lads were asked to write down questions for each other during an interview in Taiwan. Jason asked Mark if he loved him. This is why. Warnemünde, Germany: 'THAT NIGHT IN AMSTERDAM / DO YOU LOVE ME [PT.2]' - Mark's reaction to Jason's question. Tallinn, Estonia: 'FROM ANGELS TO THE MOON / THE SOUP' - Jason brings his own lunch to an interview, getting varying reactions from his bandmates. St.Petersburg, Russia: 'OF PEACOCKS' - The lads try on their costumes for The Flood video for the first time. Helsinki, Finland: 'THE PRICE OF FRIENDSHIP' - Just after the comeback, Jason got hounded by some overenthusiastic fans whilst out shopping and ended up waiting for security whilst hiding in the loos. This is what he thought about it. Stockholm, Sweden: 'ALL I DO EACH NIGHT IS REHEARSE THE PRAY ROUTINE (AND SOMETIMES IN THE MORNING TOO)' - Jason teaches Robbie how to dance Pray before Progress Live's big opening night in Sunderland. Copenhagen, Denmark: 'WHAT DID YOU SAY THIS TIME?' - Jason once accidentally called Emma a nag during a radio interview. Afterwards, he phones her to apologise.